Mixing is the most critical stage for the cement production. And mixing is realized rotating the material homogeneously and making them upside down in a basin constructed in mixers. It has two mixing shafts which are assembled horizontally and it is the best mixer type in the matter of mixing time and quality. 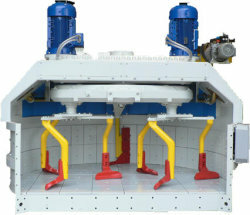 This type of mixer is preferred by the firms which look for high capacity which are 2m³, 3m³ and 4m³. It has only one shaft which is assembled horizontally and preferred for low capacity concrete production at decreased cost. Generally capacity of 0.5m³ and less is asked for. This is the type of mixer which has driven unit its underneath. It is preferred as per the design criteria and cost of the concrete plant. 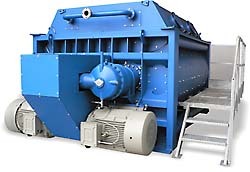 This is the type of mixer which has driven unit its top. It is preferred as per the design criteria and cost of the concrete plant.